Fewzion helps you plan and manage work by connecting the work you want to get done and the targets you want to meet with the resources and equipment you need to get the plan done. The shift planning process screen makes it easy and quick for shift planners to plan tasks and KPIs for their process each week. 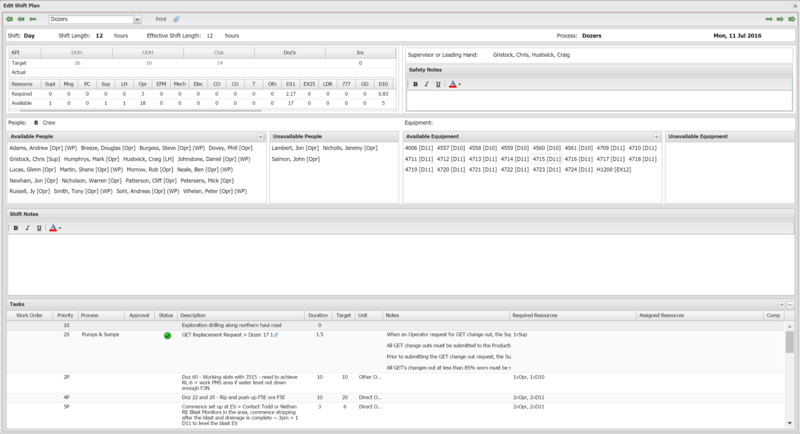 A list of predefined standard tasks enables rapid shift planning. In the body of the plan’s page, a drop-down list allows the shift planner to select from any of the existing work processes. Along the left side shift planners can select from all of the existing standard tasks. The bulk of the page displays the plan’s details by shift and by day for that specific process. KPIs for each shift are shown as are the required and available resources (personnel and equipment). Red highlights plans that currently cannot be met because of insufficient resources allocated to the process for the planned work. The Process Plan also allows for the inclusion of “shadow” cross functional tasks which are tied to a production process so that dependencies can be tracked and accommodated, for instance, the servicing of equipment. These tasks must be accepted or rejected by the process owner and colour-coded icons allow the planner to tell at a glance which items are pending approval, have already been accepted or already rejected. Click here to find out how Fewzion helps you adapt your shift plan for change. The shift plan screen allows planners and schedulers to modify every aspect of the shift plan, including KPIs, people and equipment resources, notes, tasks, attachments, and more. At the top of the screen, a drop-down box allows for the selection of a specific process. Next to it resides a link for printing the shift plan. On the same row, at the far left and far right, a series of arrows allows for navigation to a different shift, day or week, both earlier and later. 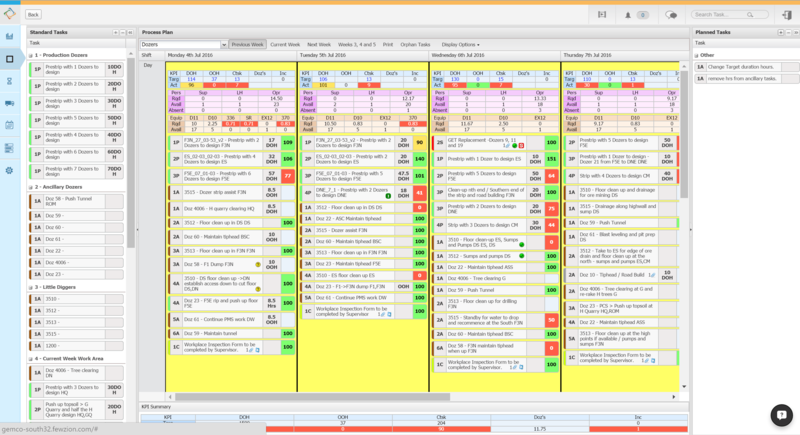 The next row, near the top of the screen, lists the current shift, shift length in hours, and effective shift length, based upon the amount of pre-production and end-of-shift activity required. It also displays the process name and the selected date. Personnel can be selected from the list of available people, and other resources can be selected from the list of available equipment. Safety notes can be added for the shift as well as miscellaneous notes letting shift personnel know of directives for their specific shift. Both shift notes and safety notes include formatting options to allow important text to be emphasised when needed. Also, personnel and equipment can be moved to their respective “unavailable” boxes, should something occur which would make them unavailable. Click here to find out how Fewzion helps you adapt your plan for change.